Situated in the heart of the 18th arrondissement a few steps from Montmartre, Kube is found on a small, calm side-street. Behind its classy facade resides a high-tech and innovative world: 41 rooms and suites, 2 bars including the "ICE KUBE", the first ice bar in the capital, 2 projection rooms, and a fitness room. Combining design and conviviality, the KUBE embodies a harmonious, open space. 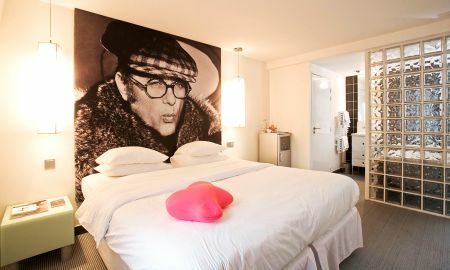 The spacious rooms have been conceived for the modern traveller and are equipped with finger-print access, multiple-use computers (CD/DVD player, TV screen), DSL internet access, safe deposit box... The designer furniture harmoniously combines cubic forms and strong materials: natural wood armchairs, flourescent stools, synthetic fur curtains, opaque night tables resembling ice cubes... The top floor houses suites and junior suites with private terraces. 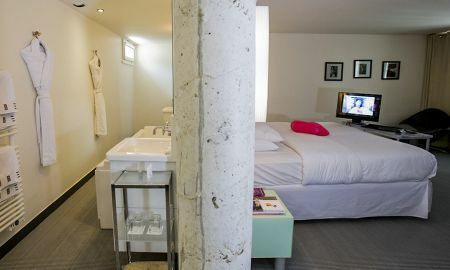 KUBE Hotel is conveniently located right in the heart of Paris' 18th arrondissement, just a few steps from Montmartre and the Metro station La Chapelle. The property will be going through renovation works from Wed 12 Jul 2017 until Fri 01 Sept 2017. During this period, guests may experience some noise or light disturbances, and some hotel facilities and services may not be available.